Give it a try, and see if you can sense the bacon/lox flavor. It’s worth it just to experience that odd pairing of nuances. Heat the olive oil in a skillet set to medium-high heat, and sauté onion for a few minutes until beginning to brown. Turn heat down to medium-low and allow to caramelize, stirring occasionally, until reduced and very soft. Toward the end of the caramelizing, turn up the heat a little and add the garlic, as well as the shallot and garlic green (if using). Sauté all together until browned and soft. 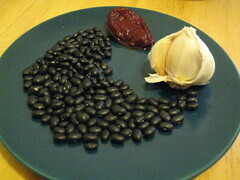 In a blender or food processor, combine all the remaining ingredients except the beans. Process until almost pureed. Add the beans and puree all together. Chill for a few hours, then serve garnished with cilantro (if desired). Great with tortilla chips or crackers. This would probably spice up a burrito or nachos nicely, too. Note: I have to extend my thanks to Ms. Mango & Tomato for the photo idea. She’s my inspiration for shooting the raw ingredients–plus I forgot to bring my camera to the party where the final product was served! This entry was posted in Recipes, Side dishes. Bookmark the permalink.